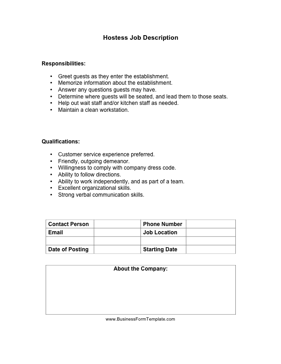 Perfect for restaurants, catered events and corporate party positions, this hostess job description covers all the necessary responsibilities and experience qualifications for the position. Greet guests as they enter the establishment. Memorize information about the establishment. Answer any questions guests may have. Determine where guests will be seated, and lead them to those seats. Help out wait staff and/or kitchen staff as needed.